Snrky: That's less painful than the real PMO practice. That's less painful than the real PMO practice. I hate just throwing the word opportunity after everything to make it more palatable. According to corporate wisdom, it's the opposite of strengths, as in here's a list of our strengths and opportunities, so when someone says there's an opportunity, it comes loaded with baggage in a corporate environment because the normal context of the word usually isn't positive. Do you want to go to dinner? I have a dinner opportunity for you. Would you like a car? How would you like a car opportunity? Here's a new job. Here's a new job opportunity. Do you like my dog? I don't have a dog, but I have a dog opportunity. See...extraneous or causing diminution of the original phrase. It denotes a lack of action. Just say, "We're tuning." If you're not sure whether to pursue it or not, then it's not an opportunity, it's not doing something. Title: That's less painful than the real PMO practice. 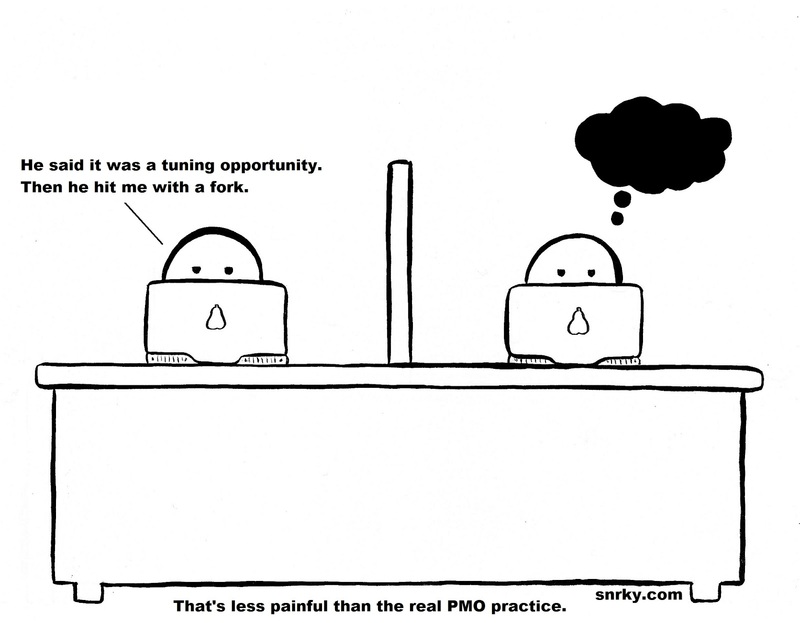 Snarky: He said it was a tuning opportunity. Then he hit me with a fork.